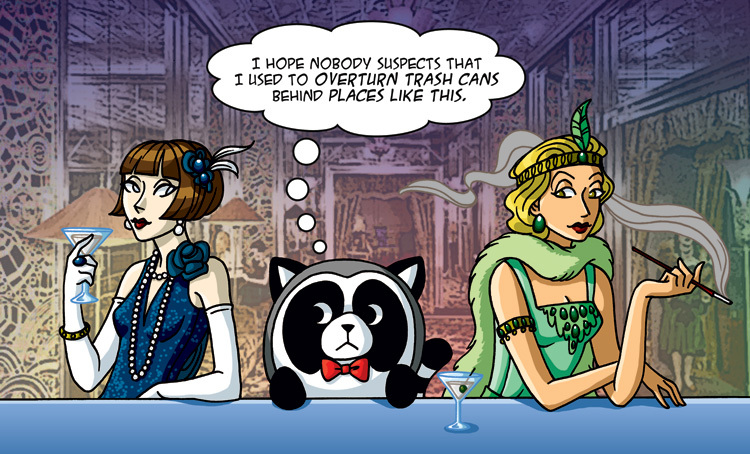 Fuzzy Five Classics #2: The Great Gatsby. Starring Nightshade! Hello dear readers! As you may have noticed, summer is here and our first arc of Fuzzy Five has ended! Our heroes have escaped the S.M.A.N. for now, but will the agency retaliate? Is the Waffletorium truly safe again? Will Nina Jr. ever get to live her dreams of being a secret agent? All will be revealed in the fall, when the second arc of Fuzzy Five continues! In the meantime, we’ll be posting some fun pinup series (Fuzzy Five Literary Classics) as well as some short comic stories featuring the Fuzzy Five and their humans (the Fuzzless Five?). Updates will be once a week on Mondays until we resume regular postings in the fall. *Speaking of which, if you’re going to be at Otakon in Baltimore, MD this weekend (July 29-31), don’t forget to stop by the Squishable booth (Booth IND22 & 23)! Not only will there be tons of adorable cuddly Squishables to buy (including some of our heroes!) but you can also get yourself some FF swag like buttons and posters! I think they can tell that Nightshade is nervous. This is seriously lovely! It also makes me want to read Gatsby again. i think each of the ladies is plotting how to get nightshade for herself! haha. p.s can i get a poster of this done for me? please?? Breakfast’s face would be different. Ooh! I want a sketch of Nightshade! And I need some posters. Hope to see everyone at Otakon! Will Zoe, Aaron and the whole gang be there? Darn, I wish I were attending and could snag a free sketch by saying ******! cant wait till it starts back up in the fall!!!!!!!!!!!!!!!!!!!!!!!! Umm….It’s Monday and I was wondering why you didn’t change the comic?